TAMPA versus ST. PETE Teams of chefs from both sides of the bay will compete for the Tampa Bay Food Fight Best of the Bay crown, judged by top chefs at Armature Works in Tampa. Restaurants from Tampa and St. Pete will be competing and guests will have an opportunity to vote for the Best City, Best Restaurant, Best Cocktail, and Best Craft Beer. Tampa Bay Food Fight guests will enjoy fun, friendly food competition, live music, food, drinks, silent auctions and more! Ticket purchase includes ALL food and drink AND free valet parking. 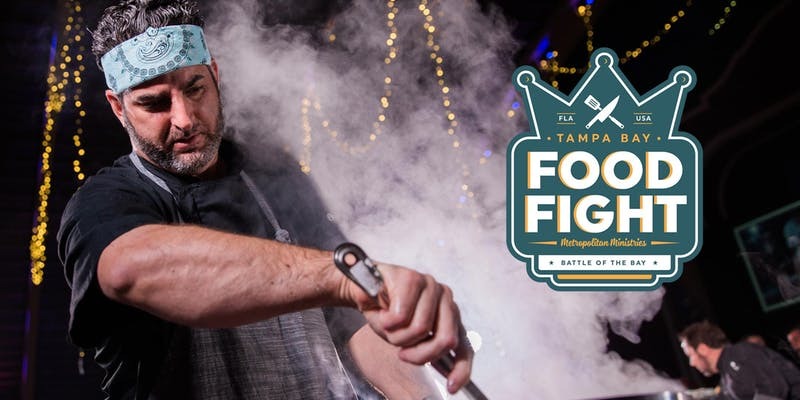 Tickets for the 2018 Tampa Bay Food Fight are valued at $25 each. Charitable contribution per individual ticket sold is $100. Federal income tax deduction is limited to monies contributed in excess of the value of goods or services provided. All gifts to Metropolitan Ministries are tax-deductible unless otherwise noted. Hi Debbie/Scott, we are from Today's Special Magazine, a new concept of advertising for restaurants over the Tampa Bay Area and we would like to promote your event in our Social Media, for free. Please let us know if it is ok with you. Thank you!